A double deck route with a letter prefix is a relatively unusual thing, in London at least. The E1 used to be single deck, but heavy loadings at school start and finish times meant that double deckers were re-introduced some years back. There is also a very heavy commuter flow between the Greenford Avenue area and Ealing Broadway, terminus of the Central and District Underground lines. The E-Line network was largely the brainchild of Centrewest which had continued to operate most of the route under tendering, although a few routes were lost. Firstgroup, which owned Centrewest, sold the operation to Metroline on 2013; as Metroline had been the main competitor in the Greenford area it thus had a virtual monopoly on local routes. In a move widely seen as punishment, three routes were awarded to other operators from May 2014 – although Metroline had in any case been undercut. 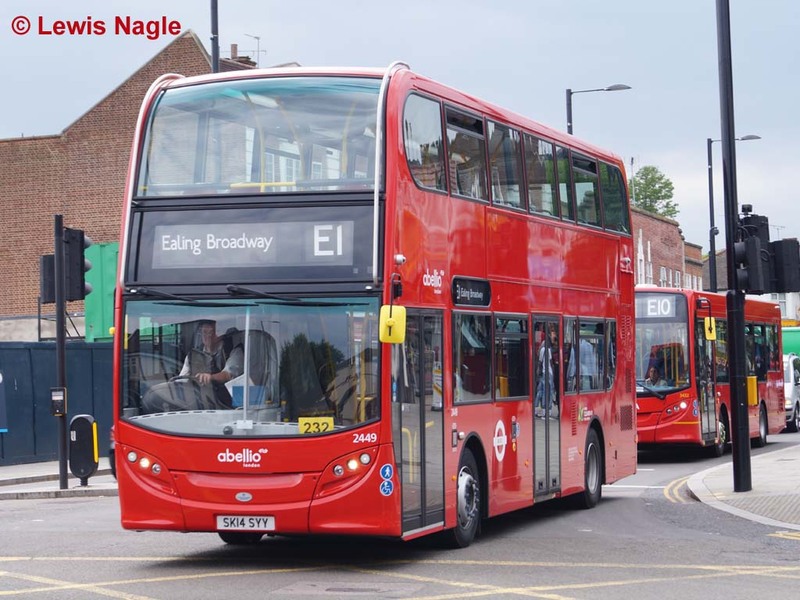 One of the routes to go was the E1, to Abellio London, operated from the ex-Wings base in Hayes. New hybrid ADL E40H double deckers were obtained. Hybrids have thus far been largely concentrated on central London routes, where pollution issues are the most acute and where slow traffic gives them the greatest advantage over straight diesels, but have started to make inroads into the suburbs. In our first picture, 2449 (SK14 SYY) climbs the hill on Greenford Avenue on the first day of Abellio operation, 31 May 2014. 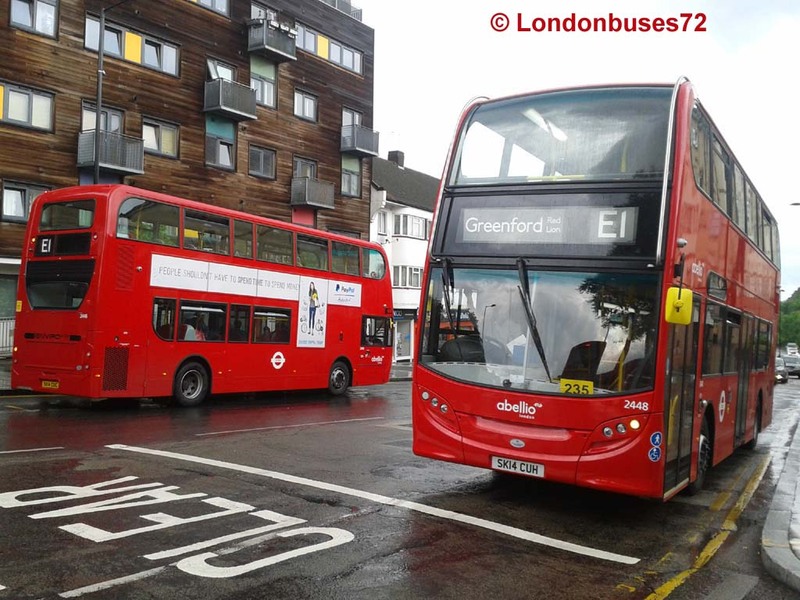 Next we have a photograph on 3 June 2014 of sister vehicles 2448 (SK14 CUH) and 2446 (SK14 CUC) respectively arriving and departing from Greenford, this being the last/first stop. Note that the incorrect destination of "Greenford Broadway" (the next stop, which the route does not serve), as specified under the previous contract, has now been corrected to the usual local name of Greenford Red Lion – although ironically the Red Lion pub, from which the junction takes its name, has recently been closed! The stops themselves go under the very obscure name of "Clifton Road", a side road nearby, which must cause some bemusement to passengers expecting to be told they have now arrived in Greenford. Given that qualifying points are only used sparingly, and that there is only one terminus in Greenford, it is a bit surprising that a display of plain "Greenford" is not used. Perhaps it is to avoid confusion with Greenford Station (which is not in Greenford). 2449, again, passes the site of the now demolished Red Lion as it proceeds from the stand in Otter Road to the first stop at the location above. This was again on the first day of Abellio operation. 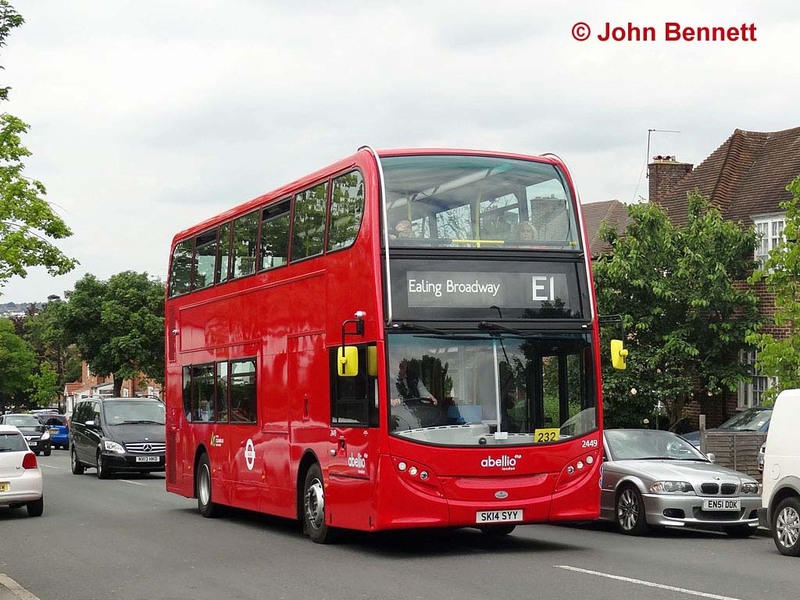 Finally we get another red view of 2446, but a nearside rather than an offside view, also on 31 May 2014. It is about to descend the hill in the first picture, where the regenerative braking capabilities of hybrids come into their own! The E1 was one of the flat fare routes introduced in the Bus Reshaping plans of 1968, designed to reduce the reliance on conductors in a variety of ways. The E1 took in the short 211 route from Greenford to Ealing Broadway, combined with an extension to Brentford via Hanwell, replacing part of the rather circuitous 255 route – and also adding the link between Boston Manor and Ealing during evenings and weekends, as the 255 had operated only between Brentford and Hanwell at those times. The 255 had been a very odd shaped route, running from Clapham Junction to Acton Vale via Putney, Hammersmith, Brentford and Hanwell! Not that the 211 was a lot better, as the otherwise fairly direct looking route between Greenford and Brentford took a lengthy detour via Ealing, almost doubling back on itself in the process. The flat fare routes were initially operated using high capacity Swift single deck buses, although these unreliable and unpopular buses were soon replaced by Leyland Nationals or double deck types. I believe the 211 had been single deck anyway, though that would still have represented a reduction in seating capacity as the new Swifts seated just 25, but with large standee areas. However, the nature of the route meant long distance journeys were unlikely, with the two legs either side of Ealing each taking around 20 minutes end to end, so standing would not have been such a daunting prospect as on some of the routes. The E1 was converted to double deck operation using DMS class Daimler Fleetlines, though these were little more successful than the Swifts. Then came the more modern Metrobus, which lasted the route for a few years more. But the route suffered a drop in capacity again in the 1980s fad for minibuses. Centrewest seemed to be particularly advanced with its fleet replacement programme, once boasting that more than half its mileage was run by minibuses. Those on the Ealing routes were Renault S75s with Wright Nimbus bodywork, new in 1990. Their introduction coincided with the split of route E1 at Ealing Broadway, the Brentford to Ealing section becoming the E8. However, these were quite inadequate for peak loadings, and very difficult for passengers with shopping, and the E1 was the first of the E-routes to lose these buses, they initially being replaced by Metrobuses. In March 1996, Centrewest purchased London Buslines from the Q-Drive group, together with buses and a base at Southall. A decision to standardise Buslines as a single deck operation resulted in the Leyland Olympian double deckers being moved to the parent fleet and being repainted red. The first 6 moved at the end of 1996, for the E1, although 25 of the remaining 27 soon followed (the other two going to Beeline). 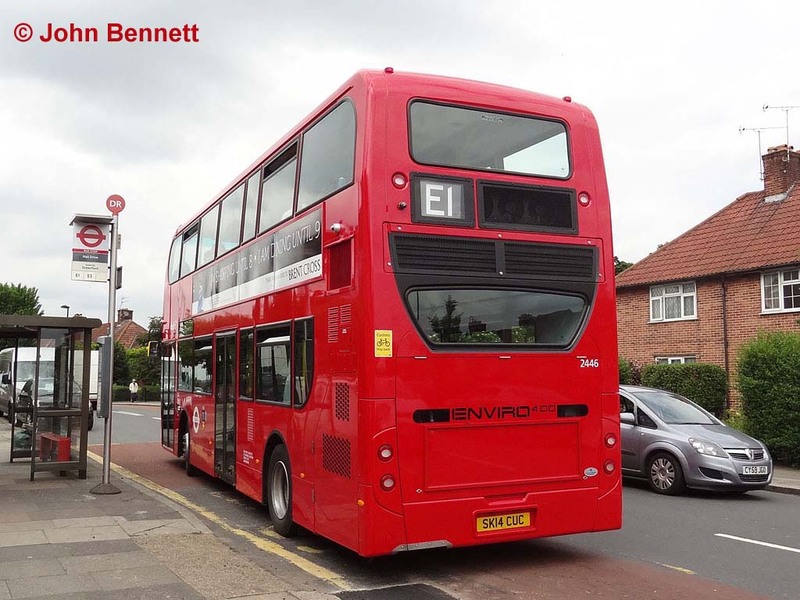 The buses had a mixture of Alexander RH, RL and Northern Counties bodywork and were put to use on the 83 and E1 from Alperton, replacing Metrobuses. Of course, all have since been replaced by low floor vehicles.